That French presidents are unpopular is nothing new. However, there is a secular trend in them getting unpopular more and more quickly upon getting into office. 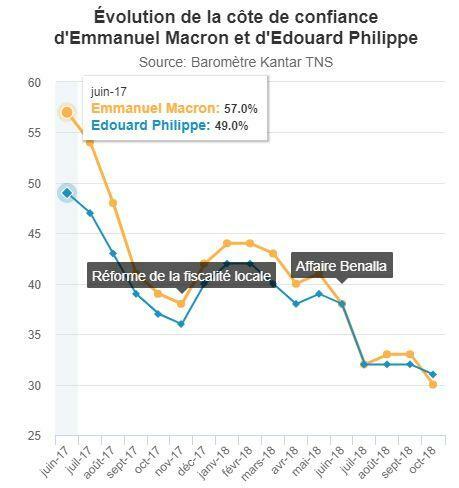 True, Macron is not as unpopular after 18 months as was the hapless and squishy François Hollande, who could deliver on virtually none of his Socialist economic promises. 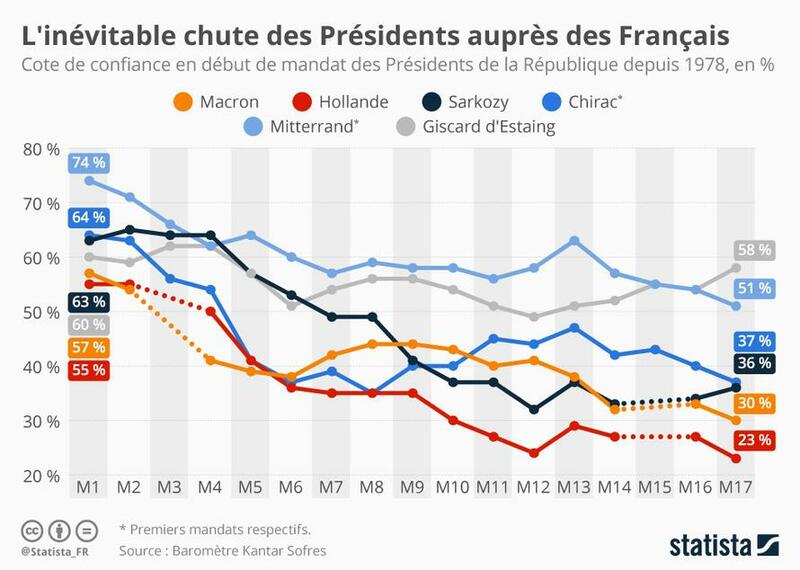 However, Macron as collapsed in popularity more quickly than Nicolas Sarkozy did, who was a one-term president. The English-speaking Macron said he wanted to turn France into a “start-up nation.” A bold ambition, but it’s worth remembering that 90% of start-ups go bankrupt. I personally don’t understand the French electorate on these matters. Macron in particular did not promise anything other than to deliver more of the same policies, albeit with more youth and more vigor, as a frank globalist. Who, exactly, was excited at his election but is disappointed now? People with a short attention span or susceptibility to marketing gimmicks, I assume. It is hard to talk about the French media without getting a bit conspiratorial, at least, I speak of “structural conspiracies.” Macron’s unabashed, “modernizing” globalism certainly corresponds to the id of the French media-corporate elites and to top 20% of the electorate, let us say, the talented fifth. He was able to break through the old French two-party system, annihilating the Socialist Party and sidelining the conservatives. The media certainly helped in this, preferring him to either the conservative François Fillon or the civic nationalist Marine Le Pen. However, the media have to a certain extent turned on Macron, perhaps because he believes his “complex thoughts” cannot be grasped by journalists with their admittedly limited cognitive abilities. Turn on the French radio and you’ll hear stories of how the so-called “Youth With Macron,” whose twenty- and thirty-somethings were invited onto all the talk shows just before Macron became a leading candidate, were actually former Socialist party hacks with no grass roots. Astroturf. I could have told you that. Macron has made a number of what the media call “gaffes.” When an old lady voiced concern about the future of her pension, he answered: “you don’t have a right to complain.” He has also done many things that anyone with just a little sense of decorum will be disgusted by. 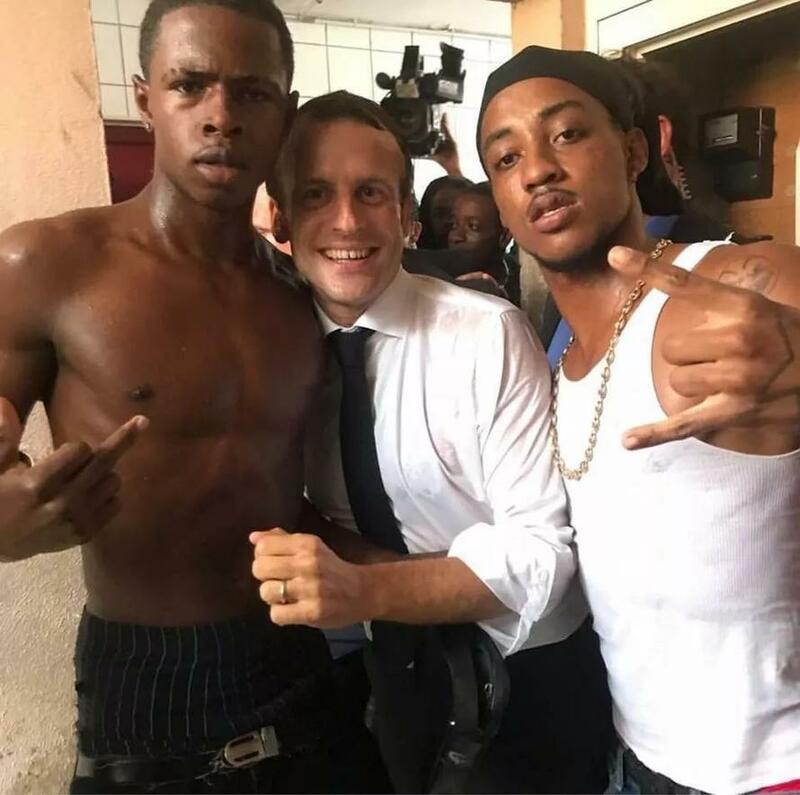 The 40-year-old Macron, who has a 65-year-old wife and claims not to be a homosexual, loves being photographed with sweaty black bodies. 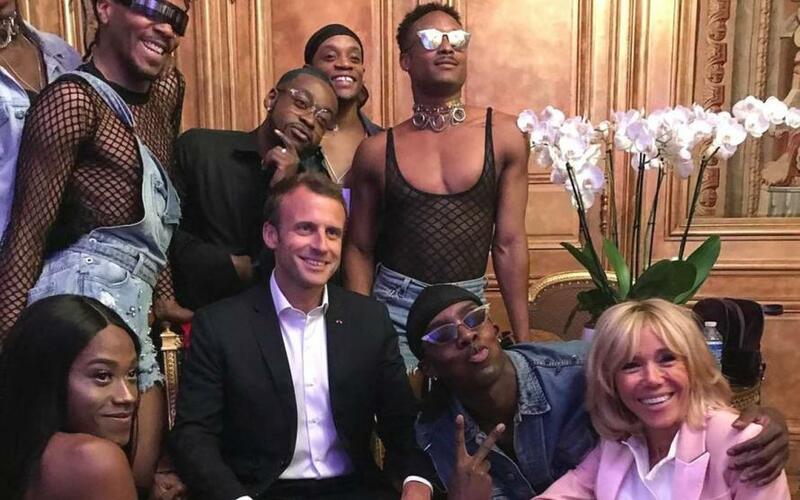 June 21, 2018: the Élysée Palace, is turned into a gay African discotheque for a today, with presidential blessings. The Palace was initially built in 1721 for the military commander Louis Henry de La Tour d’Auvergne. A desecration. Macron appearing with vibrant “future Montaignes” in the Caribbean. Macron heterosexually sharing a moment with said French youth. While Macron enjoys black bodies, he does say some sensible things. He has some realism. Macron has said that African political instability, poverty, and emigration to Europe will never be controlled unless African women have less children: “When countries still have seven to eight children per woman, you can decide to spend billions of euros, but you will not stabilize anything.” Macron has repeatedly made these comments, showing that like Bill Gates, he understands that a Black Planet with 4 billion Africans (as currently projected to be happen this century according to U.N. projections) will be a big, big problem. Macron is bold in this respect: even Viktor Orbán has not gone so far as to tell black people how they should breed. What poses a problem is the term “crime against humanity.” There is a monopoly. . . . I think it is generational. In any case, there is a problem on the expression “crime against humanity” which for many people in the Jewish community can only be said relative to the Shoah. So there’s that. But, in terms of policies, I cannot say that the people who supported Macron have any right to complain. He is doing what he promised, that is to say, steaming full straight ahead on the globalist course with, a bit more forthrightness and, he hopes, competence than his Socialist or conservative predecessors. In truth there are no solutions. There is nothing he can do to make the elitist and gridlocked European Union more effective, nothing he can do to improve the “human capital” in the Afro-Islamic banlieues, and not much he can do to improve the economy which the French people would find acceptable. A bit more of labor flexibility here, a bit of a tax break there, oh wait deficit’s too big, a tax hike in some other area too, then. Six of one, half a dozen in the other. Oh, and they’ve also passed more censorship legislation to fight “fake news” and “election meddling” and other pathetic excuses the media-political class across the West have come up with for their loss of control over the Narrative. Since the European Central Bank has been printing lending hundreds of billions of euros to stimulate the Eurozone economy, France’s economic performance has been decidedly mediocre, with low growth, slowly declining unemployment, and no reduction in debt (currently at 98.7% of GDP). Performance will presumably worsen if the ECB, as planned, phases out stimulus at the end of this year. I have been in all the neighborhoods, the neighborhoods of Marseille-North to Mirail in Toulous, to the Parisian periphery, Corbeil, Aulnay, Sevran, the situation has deteriorated greatly. We cannot continue to work on towns individually, there needs to be an overarching vision to recreate social mixing. Because today we are living side by side, and I still say, me, I fear that tomorrow we will live face-to-face [i.e. across a battle lines]. Communities in France are coming into conflict more and more and it is becoming very violent . . . I would say that, within five years, the situation could become irreversible. Yes, we have five or six years to avoid the worst. After that . . .
It’s unclear why “the next five or six years” should be so critical. From one point of view, the old France is already lost as about a third of births are non-Europeanand in particular one fifth are Islamic. The patterns of life in much of France will therefore likely come to reflect those of Africa and the Middle-East, including random violence and religious fanaticism. Collomb seems to think “social mixing” would prevent this, but in fact, there has been plenty of social and even genetic “mixing” in Brazil and Mexico, without this preventing ethno-racial stratification and extreme levels of violence. I’m afraid it’s all more of the same in douce France, sweet France. On the current path, Macron will be a one-termer like Sarkozy and Hollande were. Then again, the next elections will be in three-and-a-half years, an eternity in democratic politics. In all likelihood, this would be the Right’s election to win, with a conservative anti-immigration candidate. A few people of the mainstream Right are open to working with Le Pen’s National Rally and some have even defended the Identitarians. Then again, I could even imagine Macron posing as a heroic opponent of (illegal . . .) immigration if he thought it could help get him reelected. Watch this space . . .